Try our nursery recipes at home! 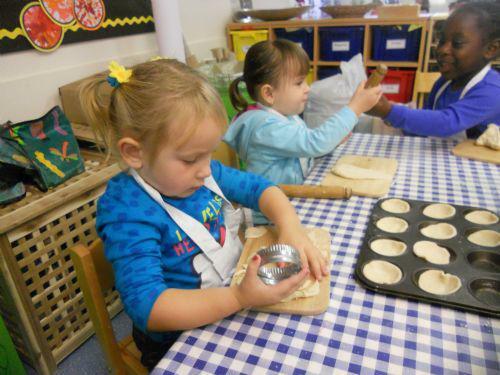 We love to cook at nursery and here are some of our recipes for you and your child to try at home. 4. Pour the smoothie into glasses and drink immediately. Heat some vegetable oil in a large pan and seasoning. Add all of the vegetables to the pan cover with water. Simmer for 40 minutes on the hob stirring occasionally. Cawl can be made all year round just adjust vegetables according to season. Cawl is traditionally made with lamb but tastes lovely without. You would need to cook the lamb first in the pan, add the onion and allow for the lamb to brown all over. Add the water bring to the boil, then reduce the heat to simmer for 40 minutes. Then simply follow the instructions above to add the vegetables. inserting a knife into the middle. If the knife is dry when you take it out the mixture will be cooked. Add whatever you fancy, bananas, lemon, sugar, syrup, strawberries or why dont you try a savory option for example adding ham and cheese, cheese sauce and broccolli, mushrooms and cheese. Tip the dough out, knead briefly until smooth, wrap in clingfim and leave to chill in the fridge for 15 minutes.Preheat the oven to 180C/350F/Gas 4. Using cutters, cut out the gingerbread men shapes and place on the baking tray, leaving a gap between them. Bake for 12-15 minutes, or until lightly golden-brown. Leave on the tray for 10 minutes and then move to a wire rack to finish cooling. When cooled decorate with the writing icing and cake decorations.